While manufacturers have been trying very hard over the last year-odd to push 3D down our throats, consumers have been very wary of upgrading thanks to the required use of glasses for 3D viewing. However, companies are now getting their acts together by announcing a few glasses-free 3DTVs at CES 2011, but they’re not expected to be out for a while yet. Fujitsu Japan have pulled a fast one by launching the world’s first glasses-free 3D PC, the ESPRIMO FH/99CM. This PC was part of their 2011 FMV line-up launch. 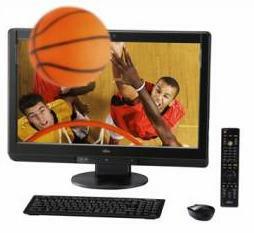 The Desktop computer boasts a 23-inch FullHD (1080p) naked eye 3D display. It also has a Sandy Bridge processor (i7-2630QM), an Intel H65 motherboard, 2TB HDD, Gigabit Ethernet, USB 3.0 support, 4GB DDR3 RAM and of course, a Blu-ray drive with 3D Blu-ray support. As you can already guess by the specs of this rig, it’s not going to be cheap! The PC is priced at around Rs. 1,40,000 which is a lot of money. Oh well, we’re guessing that’s what the first mover advantage nets you. The ESPRIMO FH/99CM is expected to release in Japan on February 25, but the company has plans for a worldwide release.